I have never lost the electric thrill that occurs when the ticket to a play passes from the box office into my hands. The first time I attended a legit performance it was an April 1974 birthday present from my folks. Jean Simmons starring in A Little Night Music at the Royal Alexandra Theatre. Sondhemim's waltz haunts me as does those heartbreakingly silly and sad characters in the play and the faces of the generations of actors in their black and white portraits that fill the stairways of the Royal Alex. I remember climbing that neverending stairway to the upper balcony for the first of countless times and seeing the faces familiar to me from movies such as Basil Rathbone, Fay Bainter, Harry Carey, Mischa Auer, and those I only knew from reading about their careers Lunt and Fontanne, Cornelia Otis Skinner. 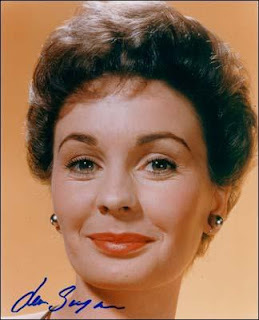 I remember Jean Simmons - coy, honest, smart, defeated, simply gorgeous and selling that song. Yes. She was Desiree Armfeldt. When I would remember to breathe I would remember that she was also scheming Lily in Footsteps in the Fog, brave Julie Maragon in The Big Country, besotted Sarah Brown in Guys and Dolls and conflicted Sister Sharon in Elmer Gantry. In 35 years of theatre-going I have seen many great names and many humbler names. I have been moved and impressed by work, but rarely have I been starstruck. Long after the details of a show have been forgotten I recall where I sat and how I sat. The sounds around me and the weather outside. The light-headed euphoria of having shared a lifetime with the folk on stage and the leaden feet that don't want to leave the theatre. Oh, how I hate to leave the theatre! There is a special place in my heart for the woman, the actress, the star that was and is Jean Simmons. That was lovely. Thanks for your blog, CW. Thanks for sharing such a terrific memory. What an experience to have had. Thanks so much for sharing your impression of Jean Simmons on stage. She was dazzling enough when seen in fifty year old films, I could not imagine seeing her perform in person, singing "Send in the Clowns" with that rueful, throaty rough velvet voice of hers. This actress was so underrated, I suspect that we have only just begun to appreciate her work. I envy you your theater-going experiences! Hello, Jacqueline and Moira, thank you for your kind words. It's marvelous that we get to enjoy our memories of Jean and her performances for years to come. Love it. Wonderful memory that never leaves you. Wish I had been there as well.